Since 2014, the Notre Dame Initiative for Global Development (NDIGD) has worked closely with the U.S. Department of State’s Bureau of Educational and Cultural Affairs and its implementing partner, IREX, to bring the Mandela Washington Fellowship, the flagship program of the Young African Leaders Initiative (YALI), to Notre Dame. The fellowship empowers young African leaders through academic coursework, leadership training and networking opportunities. The program is highly competitive, and the U.S. Department of State received more than 64,000 applications for only 1,000 placements across the country this year alone. Notre Dame’s class of 2017 Mandela Washington Fellows, 11 men and 14 women, hail from 20 countries across sub-Saharan Africa. Zeinebou Abdeljelil is an entrepreneur and economic development experts from Mauritania who specializes in information and communications technology (ICT), financial literacy, and community development. Pervenche Aliman is a banker from Côte d’Ivoire who specializes in finance, women’s empowerment, and small and medium enterprises (SME). Bright Chinyundu is a technopreneur from Zambia who specializes in banking and information technology. Elhadj Tidiane Diamilatou Diallo is an executive and entrepreneur from Guinea who specializes in financial investment, agriculture, and social entrepreneurship. Nancy Ikaa Doka is a banker and nonviolence activist from South Sudan who specializes in finance, women’s empowerment, and peace and conflict. Somia Dousa is an electrical engineer and education advocate from Sudan who specializes in robotics, education, and youth programming. Mulku Emyu is a youth advocate and ICT professional from Sierra Leone who specializes in mobile technology, e-learning, and youth mentoring. Mulu Hundera is a higher education administrator and researcher from Ethiopia who specializes in social entrepreneurship and women’s empowerment. Bright Irem is a healthcare entrepreneur from Nigeria who specializes in health commodities, essential medicines, health and information technology, and supply chain management. Anousha Purbhoo Junggee is a printer and entrepreneur from Mauritius who specializes in printing, advertising, design, marketing, and journalism. Lamba Ka is a communications expert from Senegal who specializes in public relations, journalism, marketing, and civic responsibility. Alfred Kankuzi is a software developer, mobile app developer, graphic designer, and computer science tutor from Malawi who specializes in ICT and its relationship to governance and health. Jacqueline Lawrence is a radio program director from Tanzania who specializes in broadcasting technology and journalism. Malick Lingani is a software developer and data scientist from Burkina Faso who specializes in software development, working with youth, and data management. Tiyani Majoko is an attorney from South Africa who specializes in law, non-governmental organization (NGO) management, and consulting. Sibusisiwe Mashoko is a finance expert and accountant from Zimbabwe who specializes in microfinance, financial literacy, and women’s empowerment. Catherine Morton is a technopreneur from Ghana who specializes in tourism, digital sales, and handicrafts. Xolani Ndlovu is a finance administrator from Zimbabwe who specializes in banking and government policy. Florentine Nzisabira is an educator and entrepreneur from Burundi who specializes in English as a second language (ESL) education, women’s empowerment, and rural development. Dancan Ogendo is a finance consultant from Kenya who specializes in financial literacy, rural development, and vocational training. Winnie Otokhina is an attorney from Nigeria who specializes in law, healthcare reform, and advocacy. Mouhamadoul Samb is an entrepreneur and consultant from Senegal who specializes in health and information technology, as well as education. Stella Sata is a wealth consultant from Zambia who specializes in banking, financial literacy, and women’s empowerment. Issaka Yacoubou is an entrepreneur and professional shoemaker from Togo who specializes in fashion design and disability advocacy. Aminu Yusuf is a banker from Nigeria who specializes in finance, micro, small, and medium-sized enterprises (MSME), and job creation. Throughout the six-week program, the fellows will engage in a rigorous curriculum that will cover topics including design thinking, social entrepreneurship, business modeling and planning, strategic leadership and personal and professional branding, as well as applying foresight and innovation. The fellows will also visit different corporations and organizations to observe the application of different academic topics in the real world, including organizations in South Bend, Indianapolis, Detroit and Chicago. Community service and leadership activities will also be a core component of the program. At the end of the institute, the fellows will travel to Washington, D.C., for the Mandela Washington Fellowship Summit, where they will take part in networking and panel discussions with 975 other fellows, as well as U.S. leaders from the public, private and nonprofit sectors. Following the summit, 100 competitively selected fellows will spend six weeks in professional development experiences with U.S. nongovernmental organizations, private companies and government agencies. 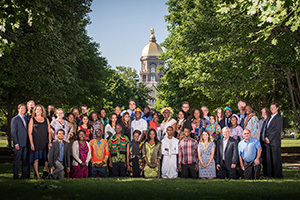 The Mandela Washington Fellowship at Notre Dame receives additional faculty support from the Mendoza College of Business, the College of Arts and Letters, the Engineering, Science, and Technology Entrepreneurship Excellence Master’s (ESTEEM) Program and the Kellogg Institute for International Studies’ Ford Family Program in Human Development Studies and Solidarity. The program also receives additional financial support from the Notre Dame President’s Circle, Bisk, Capsim, the Coca-Cola Foundation and IBM. For more information about the Mandela Washington Fellowship at Notre Dame, visit yali.nd.edu. Originally published by Luis Ruuska at news.nd.edu on June 08, 2017.